The Australian Garden show has just finished for another year and although plagued with very wet weather the designers and all those involved pulled off an impressive show. Sustainability, a key trend emerging for spring gardening this year, was incorporated into many garden designs, including that of Best in Show winner, Myles Baldwin who announced his intention to recycle almost 100 percent of his display garden, Open Woodland, into new projects and sales to clients and nurseries. The show, presenting progressive ideas on gardening, design and wellbeing, has proved to be an important event for landscape designers, giving their designs exposure both nationally and on a global scale. Alpine Nurseries was and continues to be a proud supporter of the show, supplying quality plants to many of the gardens. 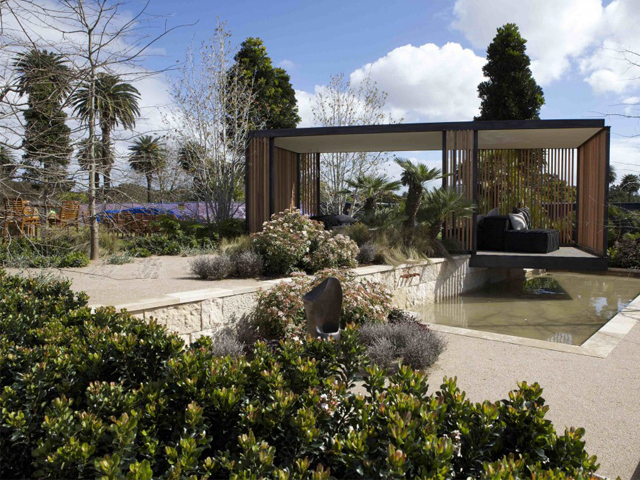 Landscape NSW and ACT design and constructed one of three major show gardens, named ‘Embrace the Landscape’ which featured literally thousands of plants ranging from small ground covers and shrubs up to advanced trees that provided scale to the structural elements. All plants were exclusively supplied by Alpine Nurseries reinforcing the commitment as an important sponsor to the LNA.